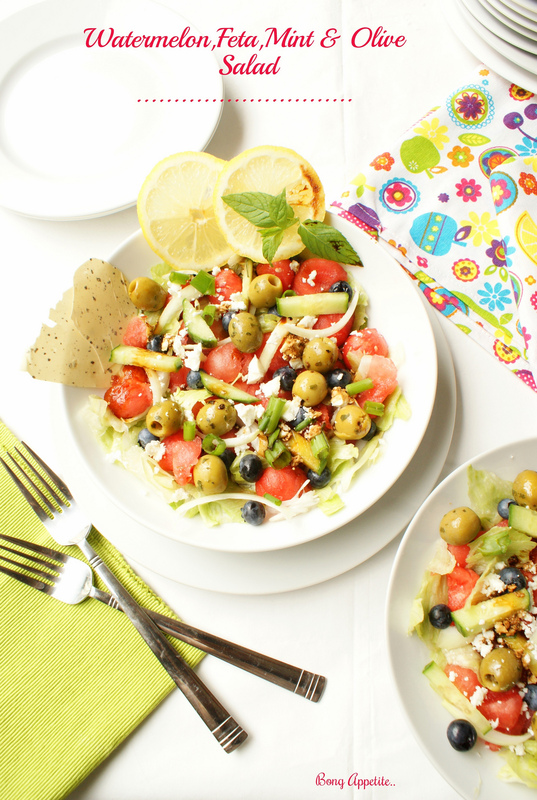 lettuce watermelon salad « Bong Appetite..
Watermelon,feta,mint and olive salad.This is summer in a bowl!Colorful summer-fresh vegetables ,chunky walnut adding a bite,flavorful herbs tossed in a lemony -vinegar dressing, this salad bursts into great flavors.Simple, everyday ingredients which are easily available ,light and fresh.This is the perfect side with the barbecue lunch.Summer is in it’s fag end here in England.While the shops are buzzing with summer ending sales,kids are preparing to go back to school,the rain is back in action(as if it was away anytime!) and more frequently now,I was mourning silently and thinking of bringing out the winter woollies out of the closet,a pleasant surprise happened. Summer decided to be nice and warm for one last time a few days back.I made a zesty grilled chicken for lunch, served it with some crusty garlic butter bread,Mexican style corn on the cob and this cool salad.Tossed with onion,mint,lemon,feta crumbles,fresh olives,spring onion I served the chilled watermelon balls for lunch in company with my favorite watermelon,strawberry and pomegranate punch.And to end the meal I made the yogurt mousse with strawberry marshmallow and blueberry compote .My perfect summer meal. That’s what I call having a good day .Going back to the salad, I love chilled watermelon in my salad.Before making the salad,I refrigerated the watermelon balls,and left them to be chilled till I was ready to make the salad.This salad is best served fresh and on the day it is made.The walnuts add a nice bite to the salad,giving it a great texture. 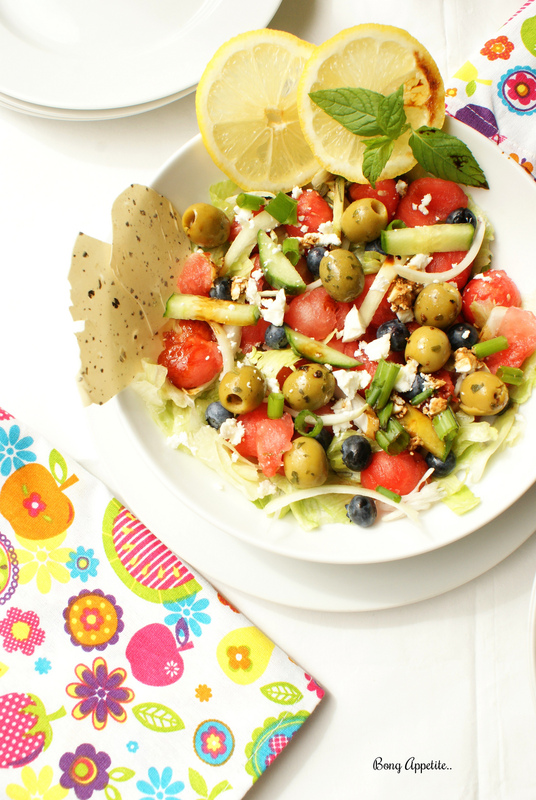 Place watermelon,onion,cucumber,onion,spring onion,cucumber,olives in a large bowl. Add fresh herbs ,feta and walnuts. 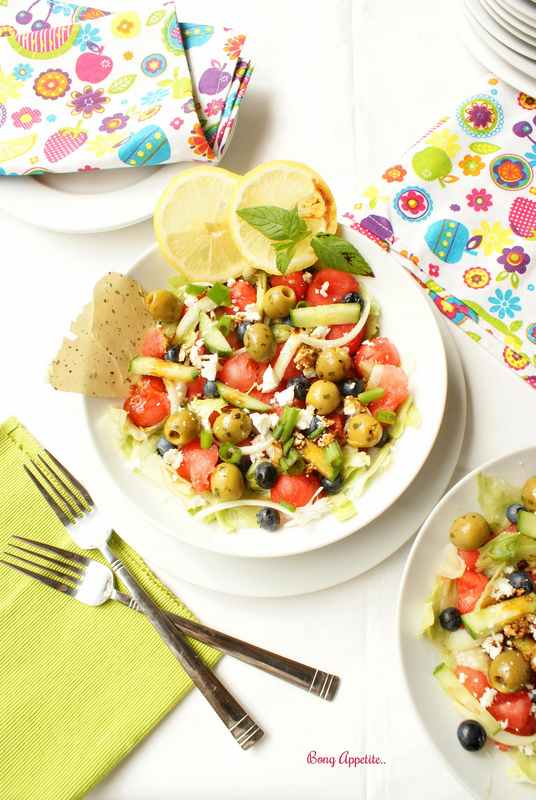 Prepare the salad dressing by mixing the lemon juice,balsamic vinegar,olive oil,salt and pepper. 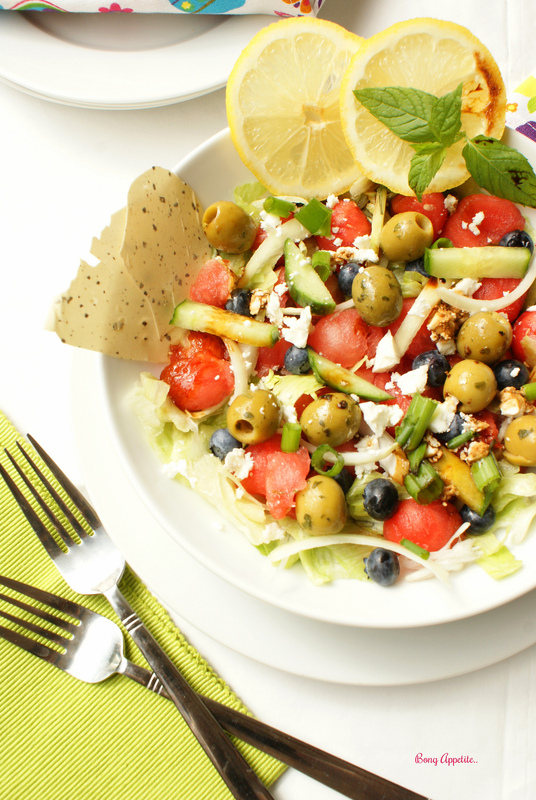 Toss the salad ingredients with the dressing and mix to incorporate.